I have a strange history with pets. My first childhood pet, at least the first that I remember, was a hypoallergenic dog who had such severe skin allergies that he was on a constant stream of steroids. His name was Bantry and he was obsessed with my mom. If my mother went out of town or was not home to feed Bantry then he would go on huger strikes until my mother returned. Even walks were something that only my mother could reliably do with Bantry. Sometimes, if we were lucky, Bantry would humour those of us who were “Not Mother” and walk a few blocks, but then he would park his rear on the ground and not move. Not Mother would have to carry him home. In university I had a series of fish, including Blanche. She once faked her own death in an elaborate, Nemo-inspired escape plot. And of course, there was Madison. My mom and I adopted Madison on Victoria Day when I was in grade twelve. The day that we brought her home for the first time we happened to have a baby squirrel trapped in our fireplace. (But that’s another story altogether.) When Maddy first entered our house, she marched right up to the fireplace, sniffed around a little bit, and then carried on like nothing was out of place. We should have known then that any dog who was ok with this scenario was not normal. Despite being a normal sized lab, Maddy seemed huge when we first got her. This is probably due to the fact that she always wanted to be with us. And I mean always. We were constantly dancing around her to avoid tripping in the kitchen and we had to re-learn how to walk down the stairs because Maddy would follow her human so closely that she might accidentally push us down the stairs if we weren’t careful. Maddy just always wanted to be where the people were. That is not to say that she was unhappy when left alone. She never destroyed anything or misbehaved in any way. We would give her treats and then she would go to sleep until we returned. She was even happier to see us go once she realised that her stupid humans left bread on the counter when they left the house. The first few times my mom and I just thought we were going crazy. We would swear that we had a whole loaf of bread, but it was suddenly gone. Then we started to find the bread bags under the dining room table. We quickly learned to keep bread, and any other carbohydrate, in cupboards. Unfortunately, Maddy had already decided that this was a fun game. Even if there was no bread on the counter, she might find some other delicious treasure! One morning my mom was out of town and I was taking care of Maddy and the house. I came home from an overnight shift at the call center, feeling guilty that Maddy had to wait longer than she was used to to get her breakfast. I was greeted at the door by Madison, tail wagging affectionately as she leaned her full 80 lbs against me. Maddy and I walked into the kitchen and simultaneously saw the tomatoes scattered across the linoleum. I looked at Maddy and Maddy sheepishly looked at the floor. Madison hated cherry tomatoes but there is no doubt that after she found her treasure on the counter she would have put each individual tomato in her mouth before spiting it onto the floor. I would never be able to eat those tomatoes, no matter how much I cleaned them. The cherry tomatoes were a comic foreshadowing of a scarier counter top incident. A few months later, I was once again taking care of the house and Maddy while my mom was out of town. On my day off from work I left the house for about an hour to pick up a Christmas present. When I returned I went into the kitchen to find shards of plastic on the floor, plastic that had formerly housed Madison’s arthritis medication. She had eaten almost an entire bottle of her arthritis medication and had to have her stomach pumped and her kidney functions monitored for some time to come. Maddy was fine after about a week. Of course, the irony that she jumped up onto the counter to eat her arthritis medication was not lost on us. Funnily, her arthritis did not flare up again for quite some time. Oh, and in case you were wondering, no it’s neither normal nor common for pets to eat medications. In fact, the vet said that he had only seen it one other time. It was one of the reasons that Maddy became a bit of a celebrity at the veterinary clinic. Maddy grew more and more stubborn as she got older. Walking with her became a practice of patience because Madison would insist on smelling every. single. dandelion. If she was in the yard and we called her to come inside it was not uncommon for her to look at us, think for a moment, and then pretend she hadn’t heard a thing. She would stand at the back door, as though she needed to go outside until one of her humans would come to let her out, then she would look at us and walk away, thoroughly amused with herself. And perhaps her worst quality was her ability to tell time. Like clockwork, Madison would start to whine at 3:00 for her 5:30 supper. Worse, she would start negotiations for breakfast at about 4:00 in the morning. So, yes, Madison caused a grey hair or two in her time. But she was also the most affectionate dog I have ever known. In her youth, if I was taking care of Maddy she would jump up onto the the bed at the beginning of the night and press herself firmly against my legs. During the night, she would shimmy up the bed and in the morning her head would be on the pillow, facing mine. As soon as I opened my eyes, Maddy’s tail would start to thump. There is something fantastic about feeling like you have made someone’s day just by opening your eyes. Madison died in October and I finally feel like I can write about it. She was old (probably 13 or 14,) sick ,and it was her time to go. 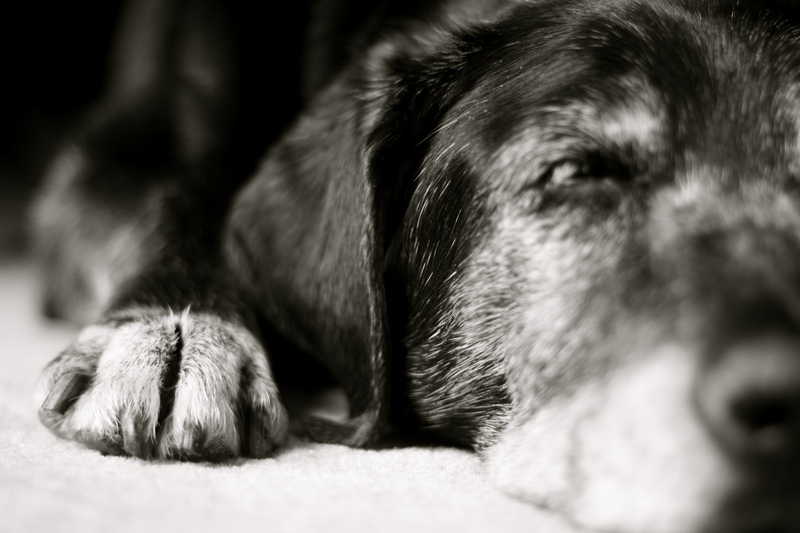 Still, just like with humans, knowing that a pet is sick does not make it any easier to say goodbye. When she died I felt like I had lost a great friend. I felt far from home in a way that I rarely do in the age of Skype and email. It was a tough time. But you know what? Time is a funny thing. I still miss Maddy in a completely irrational way but I also look forward to my next dog. Because my next dog will be my dog, not a childhood pet. And hey, with any luck, perhaps my next dog will be a normal animal. One who does not have chronic allergies, or fake its death, or go on drug binges when I leave the house. Maybe, but I won’t make any bets. *A note to those of you who have subscribed to my blog: I have grown a little self conscious about my writing for some reason and the only way that I can think to get over that is to write more. So I have set a challenge for myself to try to write daily for a few weeks. However, I can’t make any promises about quality.(Hah! Not that I ever could!) So it might be a good idea to unsubscribe for a little while, at least until February.